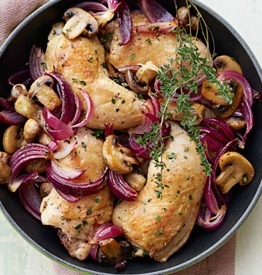 Add the ingredients in a cast-iron or heavy skillet and top with 4 chicken-leg quarters. Roast at 450 F for 35 to 40 minutes or until cooked through (165 F). Serves 4.